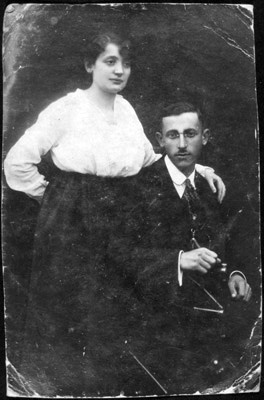 Renee's parents, Rose Borenstain-Fuchs and Moishe Chiel Fuchs, Koszenica, Poland; ca. 1915. Renee's mother was born in the 1890s and perished in 1945 in a Czestochowa labor camp. Her father was born in the 1890s and made his living as an accountant for a bank. He was executed during the war in an unknown camp.